Mick Schumacher is tipped to carry the famous surname into Formula One as the newly-crowned European Formula Three champion finished the season with his 14th podium placing on Sunday. The 19-year-old son of stricken Formula 1 legend Michael Schumacher took second in the final race of the 2018 season at Germany's Hockenheim circuit. Having already been confirmed European F3 champion on Saturday, Schumacher finished the last race of 2018 behind his Prema team mate Robert Shwartzman for his 14th podium place in the 30-race season, with seven wins. "Mick has the racing genes of Michael," said Gerhard Berger, boss of the German Touring Car championship. "If he can continue to deliver performances like these, then he will find his way into Formula One." "He can be a big name in our sport," said Mercedes boss Toto Wolff. "The boy was in the spotlight from the beginning and was under huge pressure, it's far from easy to deal with that." For the teenager with the one of the most famous surnames in motorsport, the first major title of his career was "a nice feeling and confirmation that we're doing something right," he said, making sure to thank his Prema team for their support. Schumacher has qualified for a FIA "super licence", a prerequisite to race in Formula 1, and is weighing up whether to move up to Formula Two or higher. "Not yet," he replied when asked if he has decided about his future, but revealed talks are in progress. 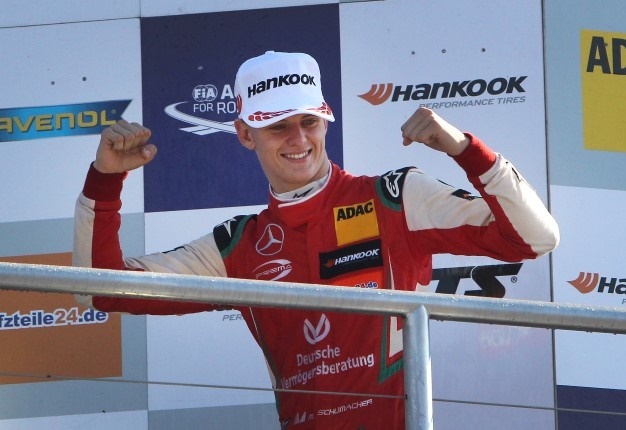 Schumacher's success has generated huge interest in F3. On Saturday night, he was interviewed live by German national broadcaster ZDF, yet the condition of his father was not addressed.